Many Virage owners have reported problems with the immobiliser and we have had our share of issues as well. At this age, the thing seems to have a mind of its own, and its role in cutting off the fuel pump etc makes it pretty central to the smooth functioning of the vehicle. The Immobiliser and alarm are one unit located in the front of the engine compartment (behind the front cross member and above the oil filter) – not a good location for a sensitive component, and one that is likely to hasten corrosion and eventual malfunctioning. The nature of the beast means that you cannot disable it just by cutting the wires, and there is no reference in the Virage parts or workshop manual to the wiring diagram. As a result, ours has lurked, bypassed, but malevolent all this time. You can never be sure that it has struck either, making problem diagnosis particularly awkward. Recently however, the estimable G*rry after a monumental trawl of the internet actually located the wiring diagram of the original Cobra part – buried deep in the web site of a jobbing French auto shop. And I am pleased to present it to you here. You can download the full version by right-clicking on the diagram and selecting ‘download link’. One slight drawback, as you may have observed – it’s all in French. 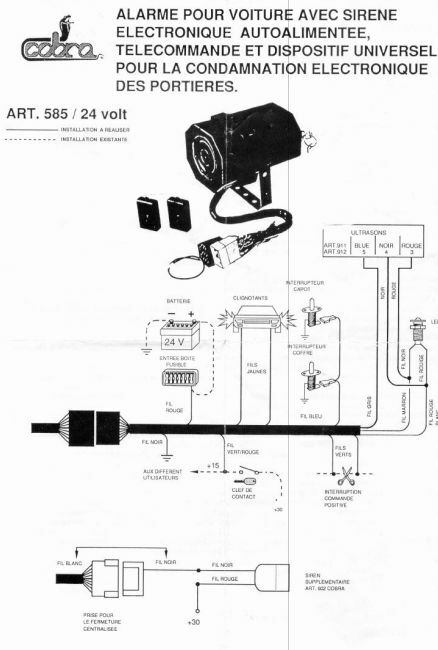 However, such is the prized nature of this wiring diagram that we’d have settled for Serbo-Croat.